When you’re having back pain, neck pain or headaches, every day counts. That’s why most people are already taking pain medication even before they consult a chiropractor. No one has time for back pain. Back pain can affect more than just bending, lifting and twisting. It influences how you feel all day long. Whether you’re suffering from back pain or neck pain due to an injury, arthritis, or a disc problem, chiropractic care is a drug-free solution that works quickly and can help you get back faster to things you enjoy doing in life. Is your back pain not getting better? Add Activator® to your pain medication for faster pain relief. The vast majority of back and neck pain is caused by muscular strain resulting in joint dysfunction that leads to inflammation that causes pain. The way Activator chiropractic manipulation (or adjustments as some people call it) works is relatively simple. 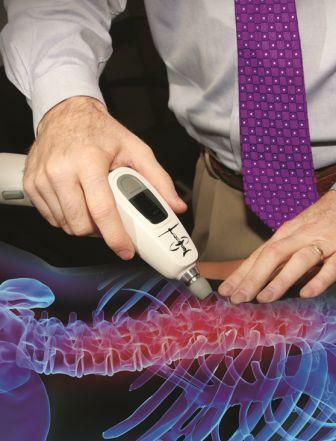 An instrument is used to apply a controlled, fast thrust to the affected joint. This gentle and precise manipulation of the joint helps restore proper motion or position. Animal studies suggest that Activator manipulation can significantly reduce the severity and shorten the duration of pain caused by inflammation. Human studies have also shown that Activator chiropractic manipulations caused a reduction of inflammation in patients with chronic low back pain. Add Activator® to feel better so you can get back to doing the things you enjoy doing in life. And, add massage and laser therapy to your Activator chiropractic care, which provides even faster relief in fewer visits. Contact us today for an appointment today. Find out if Activator® can help you get back faster.